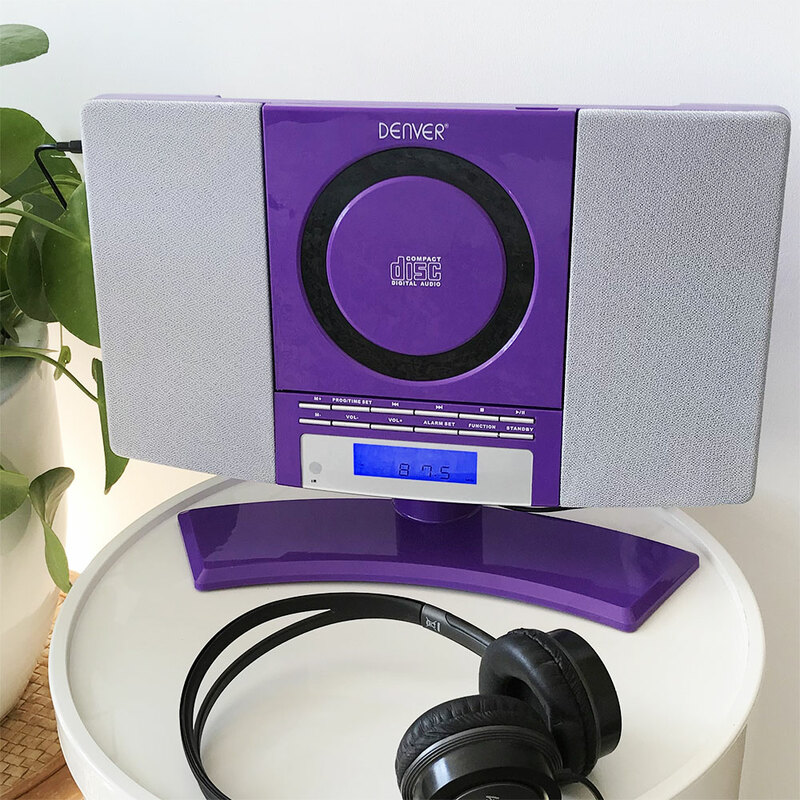 The Denver MC-5220 purple CD player is a compact, wall mountable, micro system with FM radio and clock alarm that also has battery backup. The MC-5220 also includes a desktop stand as well as being wall mountable and has auxiliary input socket. Located on the rear of the MC-5220 are 2 wall mounting fixing points to allow the player to simply and safely hang from 2 screw heads. 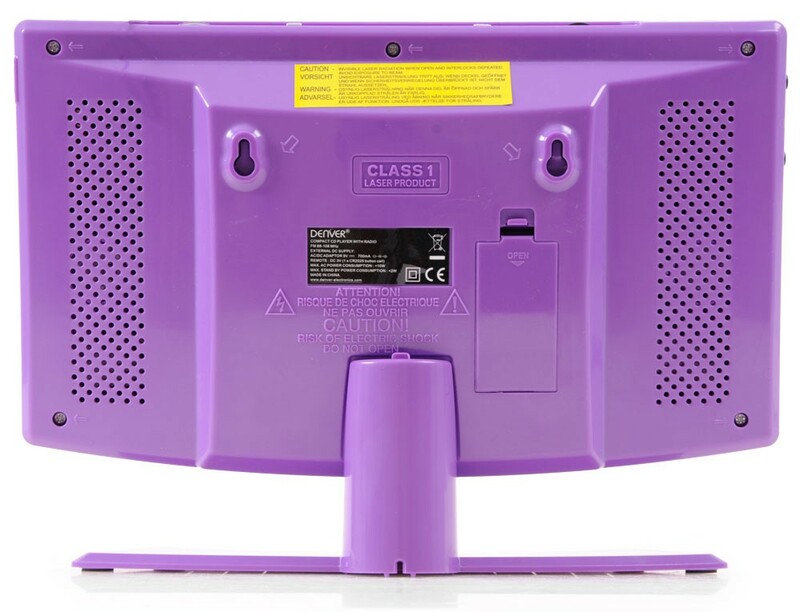 Alternatively simply click the base on the MC-5220 and pop it up on to a window sill or table. The MC-5220 supports 2 separate alarm times on the alarm clock. Plus you can choose to wake up to buzzer, radio or a chosen CD. Using the snooze function you can snooze your alarm for 9 minutes for a little extra lie in! 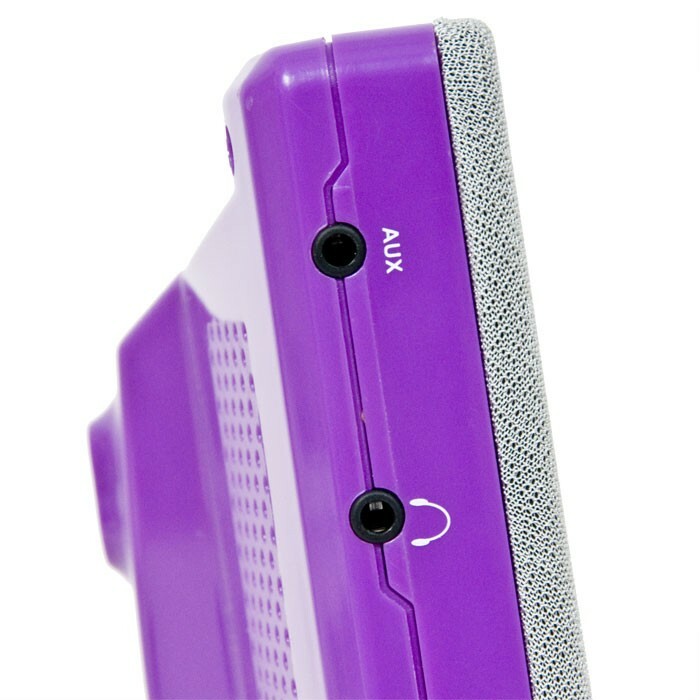 The LCD display is easy to see with a blue backlight. 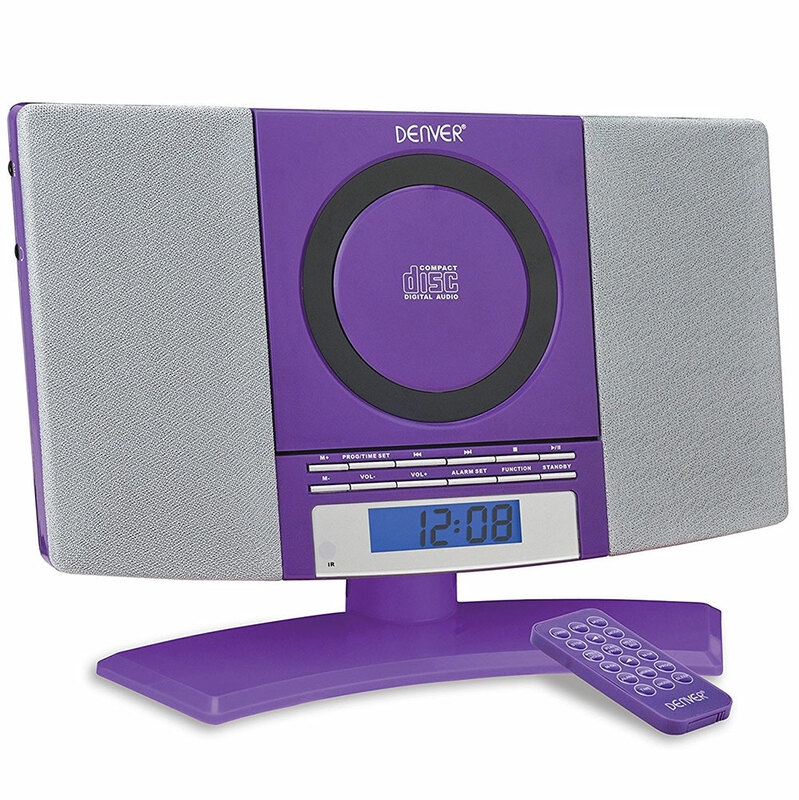 Using the built in sleep function you can listen to your favourite radio station or CD as you drift off to sleep. Set the player on to Sleep for 10, 20, 30, 40, 50, 60, 70, 80 or 90 minutes and once the count down sleep timer hits zero it will automatically power the player off. 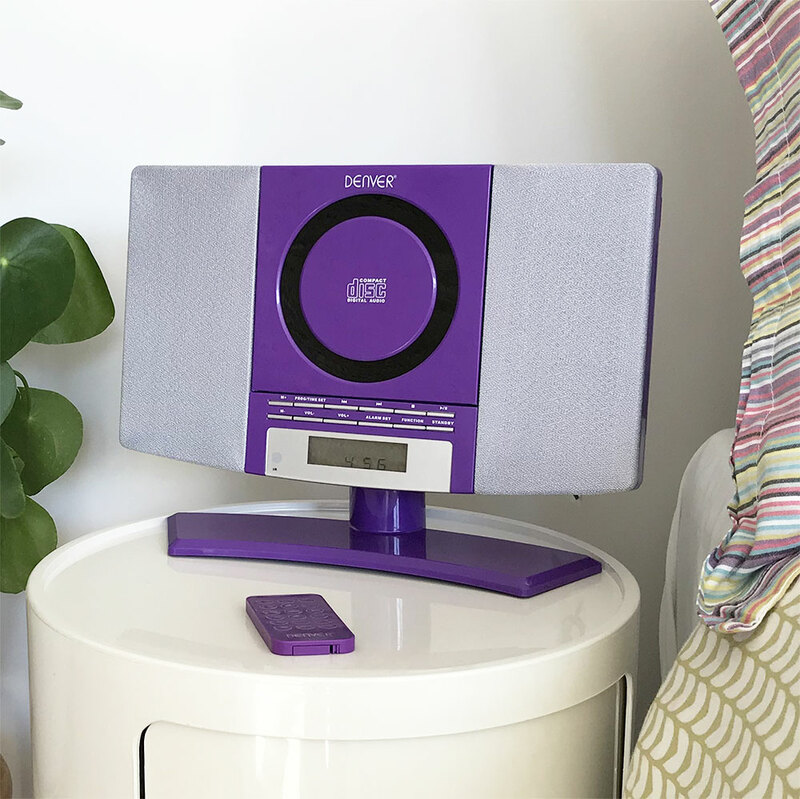 20 preset stations means you can save up to 20 of your favourite radio stations for easy and quick access. Very pleased with the service i got and the item i purchased. This is a cheap CD player, so don’t expect a super-sturdy bit of kit, but for the price it is fine. 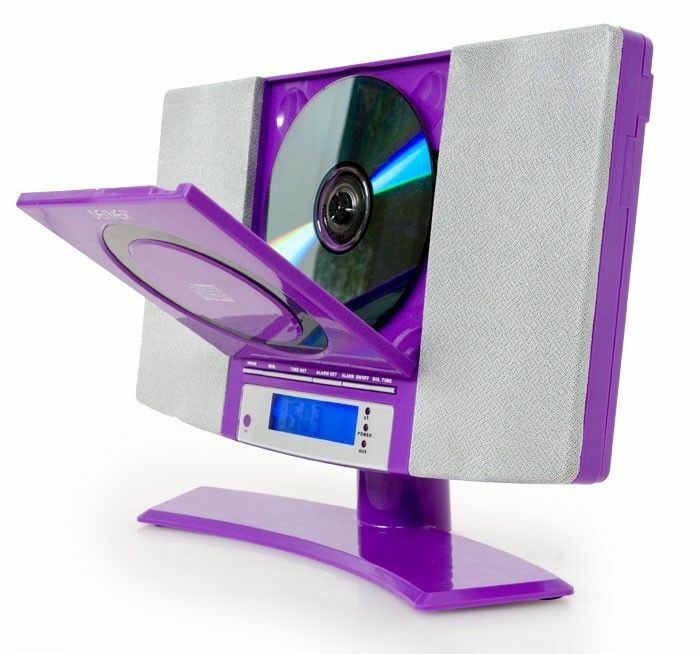 My daughter loves the colour, and it does what you want a CD player to do. The radio is OK, no problems, and pleasingly the volume doesn’t go too loud so no distortion! As advertised, delivered promptly, and the company communicates well throughout the process. Cheaper direct from the company than through Amazon or eBay too!! Smaller than imagined but nicely formed! Easiy assembly and operation so my 10 year old granddaughter will love it, especially the colour. Basic but does what it says on the tin. Not too loud either. Smaller than I thought by my granddaughter will love it. Simple modern design and has a radio and earplug jack which will be useful for quiet listening. No earphones which is a shame. Good price. Small, neat and compact. Great value for money. Good product, 8 year old daughter loves it, I would recommend. Article is cheap looking, tone and output is poor. Also thought everybody included Saturdays as a working day. Fast, convenient, economic delivery of goods is ensured with our FREE delivery, same day shipping and next working week day delivery offerings. Place an order for in stock goods before 3PM any day Mon-Fri (not including bank holidays) for guaranteed same day shipping. We provide the option of FREE delivery with a 3 to 5 day postal service on the vast majority of goods we sell, plus a reasonably priced premium fast delivery service on all goods we sell. For the fast delivery service delivery is due on the very next working week day (Mon-Fri not including bank holidays) following the day of shipping. So order on the premium fast service Monday by 3PM and your order will be due for delivery on Tuesday. Our shipping partners provide tracked delivery, customer delivery progress notifications, and options to re-schedule if the first delivery attempt is missed for any reason. Please refer to our comprehensive delivery information for more details. 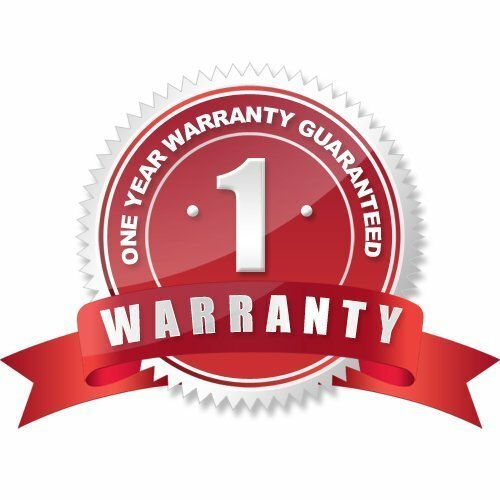 You can buy from 3wisemonkeys in full peace of mind, knowing that every product we sell comes supplied with a year of warranty cover against fault. The warranty enrolment is automatic, beginning on the date of goods delivery to you – there is no registration form to complete or other action for you to take. Warranty is supported by us here at 3wisemonkeys from our office just outside London, by our knowledgeable and helpful technical support team. If you experience any set-up or performance issues with a purchase from 3wisemonkeys please feel free to get in touch with our technical support team, who will be pleased to guide you through to a solution. On those rare occasions when technical support team advice doesn’t resolve an issue, the team can arrange a return for credit/replacement. Please refer to our comprehensive returns information for more details.